Providing elegant, authentic belly dance and world dance entertainment...perfect for weddings, parties and corporate events! 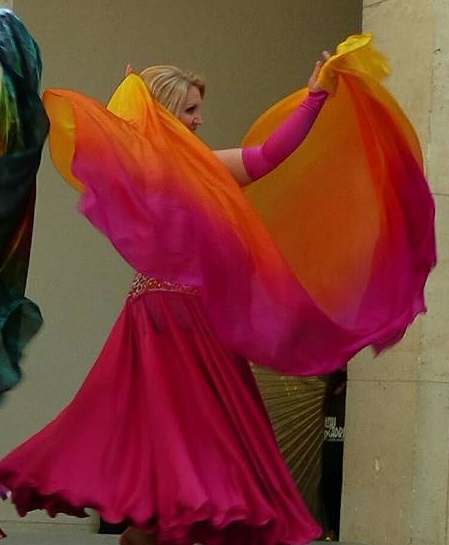 A show performed by Dalila may include Bellydance, Bollywood influences or Middle Eastern “folkloric” dances such as Dabke, Saidi, Beledi or Raks Shaabi. Props such as Zils, Veil, Isis/LED Wings, Silk Fan Veils, Shamadan or Cane may be used to delight audiences. Dalila has years of professional experience performing at weddings and events. Whether performing in a Zaffe or local festival, Dalila’s show brings both beauty and authenticity to every event! Delila is gracious with her dancing. Loved the way she engaged the crowd with plenty of props, and thanks for making it a memorable event. Thank you...what a lovely event and so much fun!! Dalila is a professional and wonderful person! We will definitely be using her in the future! Thank you so much, and I do hope to work with you in the future!! The ladies were wonderful. The music was fun, upbeat. One of the girls played a ucalayle and sang and she had a very nice voice! The costumes were awesome. They had what looked like butterfly wings with lights. They invited some in the audience on stage to teach them to dance to a song and also had a limbo competition. Everyone really had a great time. Very easy to work with. I would recommend them and have them back anytime. Thank you for the wonderful review...we loved this event! Wonderful crowd and always a pleasure working with you. Please contact us any time for another performance!! Dalila came to perform at our house last night and she was absolutely fantastic. She is a great entertainer and keeps the crowd engaged throughout her performance! Thank you so much, it was my pleasure. What a wonderful event and an amazing audience!! She was fantastic and LOVED by everyone!! Wonderful audience and so much fun...thank you so much for having me!! My customers really enjoyed the dancing. Amazing luau and venue...an absolute joy to perform for this crowd!! Dalila's performances are tailored for each event and venue. One show may feature traditional folkloric dances of North Africa while another performance may include modern cabaret belly dance or songs from popular "Bollywood" movies. As a versatile dancer with collegiate and formal dance training, Dalila is able to offer the perfect show for every customer! Throughout Michigan as well as Canada, Dalila has performed and instructed students in the art of belly dance, or “Raks Sharki”. 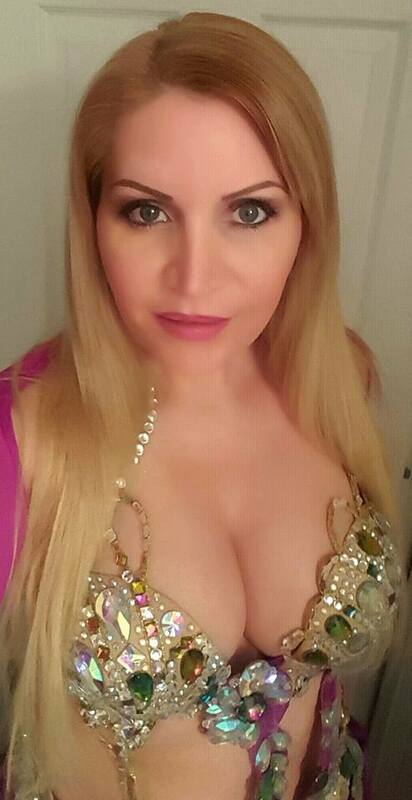 In an effort to accurately represent authentic Middle Eastern dance and enhance her technique, she has studied under Metro-Detroit’s premier belly dance instructor, Princess Madiha. In addition to private lessons, Dalila lived overseas and traveled throughout Tunisia, studying native, folkloric dance forms. Adding to her extensive and unique repertoire, Dalila is experienced in both ballet and tap as well as having participated in professional dabke and multi-cultural dance troupes at such venues as weddings, universities and the Detroit Institute of Arts (DIA). Her formal training also includes collegiate studies in Contemporary and West African dance forms at Western Michigan University while completing studies in Cultural Anthropology. Dalila's dance embodies a deep appreciation for culture, and she is passionate about sharing her experience through performance, education and instruction. A show performed by Dalila may include Classic or Modern Egyptian Bellydance, Bollywood influences and Middle Eastern “folkloric” dances such as Lebanese Dabke, Saidi Tahteeb, Beledi or Tunisian Raks Shaabi depending on the venue. Any number of props might be used to delight audiences such as Zils, Veil, Isis Wings, Silk Fan Veils, Shamadan or Tahteeb/Cane. Dalila has years of professional experience performing at weddings, parties, universities, restaurants and corporate events within various communities. Whether performing in a Zaffe or local festival, Dalila’s show brings both beauty and authenticity to every event! Requirements include a stage area for dancing as well as an area for dressing/changing costumes. Prefer to have a sound system ready for performance, can bring basic sound equipment if needed.